Why did you become a member of the FAC? Jimmy: Regular visits to the opera, museums, art exhibits, concerts, and galleries, was part of growing up and highly encouraged by my family. I performed in show choir, acted on stage and sang in musicals, played in the orchestra, and appeared in film. These experiences developed a foundation and cultivated my appreciation for the fine arts, which I am now passing onto my daughter. With the family membership plan, we have access to the theater, galleries, and Bemis School of Art. The FAC offers a local home for our artistic inclinations. Katelyn: I’ve always loved making art and it’s fun. 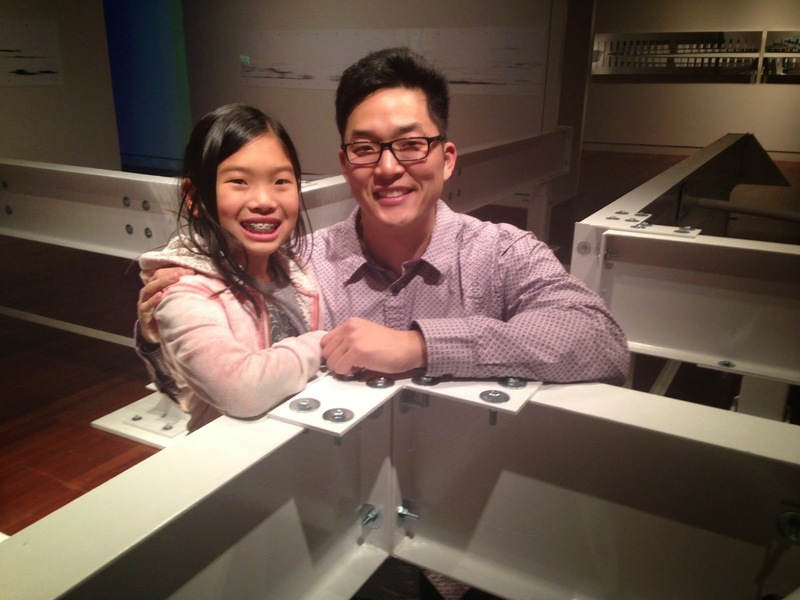 I’m a member of the FAC because I am on the plan with my dad and I take art classes at Bemis. Jimmy: Instead of an alarm clock to wake us, my mother played vinyl records of Beethoven’s 5th and Vivaldi’s Four Seasons, regularly turning the volume up to 11 on our monstrous speakers. I remember regular visits to the Getty, Huntington Library, and the Orange County Performing Arts Center. My mother also sent us to art school so we could get some fundamental training in areas such as lighting and composition – these classes were invaluable. Katelyn: I remember taking several classes at the Bemis School of Art and loving the experience. I especially loved the cooking class. Painting and sculpting were also favorites. I hope to attend another class to learn how to throw pottery, so I can make vases and pots just like the ones on display in the Bemis student gallery. What has been one of your favorite plays, classes or exhibits at the FAC? Jimmy: The Wizard of Oz? Jimmy: We loved Oz, best show last season. It’s difficult to create and deliver a performance that stands with nostalgia, but Oz did it marvelously and so did Mary Poppins. Halfway through this interview, we attended Poppins – one of the best shows I have ever seen. Words can’t describe the pure joy and excitement I felt watching this performance…well, there is a word (even though the sound of it is something quite atrocious). It was also great to see many familiar faces returning to the stage in Poppins. Katelyn: I loved the Bemis art classes, especially the painting and cooking classes. Really loved cooking, did I mention that? Jimmy: A memorable exhibit showcased the work of wounded warriors in the Bemis student gallery. I’m glad to see the FAC provide a safe space to display our military veterans’ talents in their time of healing. What is your favorite work of art on display at the FAC right now? Jimmy: There are quite a few. Anish Kapoor, specifically Shadow IV – Orange Plate is quite soothing as I move between meticulous gradients or color. It’s done well. Ahn’s Forked Series #29, is pretty awesome. I could take it in for hours. Sanchez’s pair, San Vato and María, are great takes on the retablo. Katelyn: Kasahara’s Between the Lines was great during the summer. I really liked the umbrellas. Right now, Collin Parson’s Divided is my favorite. We should sit in front of it for a longer time on our next visit. creativity, think deeply about the meanings behind each piece, or just appreciate its beauty. You can do all or none of these. It’s up to you. Katelyn: Camping! Biking! Fishing! Skiing! Playing video games! Does that count? Jimmy: Colorado is the ultimate outdoor playground. We enjoy staying active during all seasons and love to take in nature in any weather. Katelyn: …and let our dog swim in the lakes! Jimmy: This city has a great variety of activities. them all here. Katelyn: There’s no place like home!